Dietary survey is done to assess the quantities of food items and nutrients consumed by the family or an individual. The nutrition composition is calculated using tables of nutritive value of common foods. These tables are given in the ICMR publication: Nutritive Value of Indian Foods. 7. Sunder L, Adarsh, Pankaj. Applied nutrition. In: Sunder L, Adarsh, Pankaj, editors. 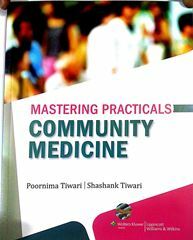 Textbook of Community Medicine, 1st ed. New Delhi: CBS Publishers and Distributors; 2007.